At a distance of less than 32 km from Male airport, the Vivanta by Taj – Coral Reef, Maldives, lends its splendour to the scenic island of Hembadhu. Getting to Vivanta by Taj – Coral Reef, Maldives, is as thrilling as the place itself, when you transfer to the resort in a luxury speedboat. Get ready to enter a world of pristine white sand, magnificent coconut palms and bliss best describe the Vivanta by Taj – coral Reef, Maldives. This tropical retreat provides awe-inspiring views of the sea, along with every modern facility, bringing to you the very best there is to offer. The ‘Charm’ villas are situated on the beach, and have thatched roofs to provide a breezy, refreshing atmosphere. The ‘Delight’, our deluxe villas, has large beachside porticos that let you bask in the sunlight and watch time pass by. And if tranquility is what you seek, choose our ‘Indulgence’ villas built over water that gently splashes beneath you. On the other hand, those who want to be thoroughly spoilt, we recommend our ‘Nirvana’ beach suites. With plenty of outdoor space for relaxation, the suites also provide exclusive amenities like private pools. It’s just remiss to call a place paradise, if it doesn’t have its fair share of culinary delights. And at Vivanta by Taj – Coral Reef, there’s an array of appetizing cuisines for you to enjoy. Relish exquisite Asian, Indian and Continental cuisine at Latitude, our all-day dining restaurant. And if you like to have a fresh wood-fired pizza, then order one at any time through the day, at Pizzeria. The elegantly styled, spacious beach villas are 58 square meters of pure luxury. Designed in muted and soothing pastel shades with a large comfortable sea-facing bed, our airy Superior Charm beach villas at Vivanta by Taj – Coral Reef, Maldives work their magic on you with brilliant views, outdoor showers and a uniquely designed open space. With stylish thatched roofs, these stunning rooms offer total privacy for your tropical getaway. At these beach villas, you can enjoy all the best comforts. Wrap yourself in 100% cotton robes, enjoy delightful bites with our 24-hour in-villa dining or simply enjoy a movie on our 32″ LCD TV with home theater system. Come, let us engulf you in pleasure. 4 nights in a Superior Charm Beach Villa valid for stays from 16 July ’16 to 30 September ’16. Bed & Breakfast basis. Half Board, Full Board and All Inclusive packages available at extra cost. Contact us for details. Return speedboat transfers from Male. These Deluxe Delight beach villas in the Maldives offer you 66 square metres of exotic sophistication with thatched roofs, an outer deck and space for dinner. Large glass bay windows show off amazing beach views. Sink into our large comfortable king-sized bed and wake up to the stunning view of the sea. With stylish furniture, soft bathrobes and slippers, get ready to be spoiled at our Deluxe Delight beach villas at Vivanta by Taj – Coral Reef, Maldives. With only the best of in-room dining and amenities, we make sure you holiday in style and comfort. And, if you want to stay connected on the go, we’ve got you covered with our Wi-services and tech facilities. Swivel shaving mirror, hair dryer. 32″ LCD TV with home theatre system, iPod dock and DVD player. 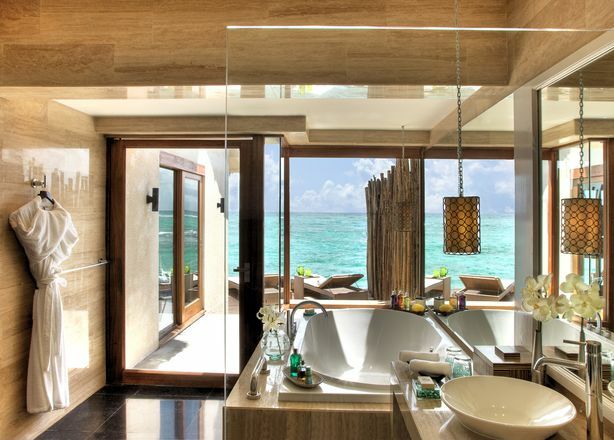 Your stay in a Premium Indulgence water villas at Vivanta by Taj – Coral Reef, Maldives will indulge all your senses. With 85 square metres destined to be your personal paradise, a thatched roof and an outer deck overlooking the water with sun loungers, this is an ideal space for dinner. Complete bliss! The indoor-outdoor experience wouldn’t be complete without an open air shower and a wide wooden ladder going straight into the lagoon. Indoors, you are pampered with a large relaxing sea-facing bed, wardrobe and direct access to the outdoor deck from the bedroom and bathroom. Other fittings include a plush day bed, stylish furniture and the Treat Yourself minibar, which includes organic foods and beverages. Let your tropical transformation begin. 32″ LCD TV in the bedrooms. An all-day multi-cuisine restaurant, Latitude will surpass all your expectations. You can taste flavours from all across the world here! Eating under the sky and stars is an experience like nothing else. So, Vivanta by Taj presents Open – The Grill, an al fresco dining experience overlooking the lagoon and the swimming pool. Guests are treated to a newly introduced South American concept in this Mexican restaurant, a first for Maldives. South and Central American cuisine is soulful and full of robust flavours that are lent by the dry chillies used and the classic yet simplistic approach to plating. With food inspired by the flavours of Peru, Mexico, Brazil and Argentina, it’s a real treat. Among the dishes you must try are our rolled corn and flour tortillas, along with traditional breads from this region. And, to add to the contrast, there’s a poolside, wood-fired pizza oven where we dish out the best pizzas Maldives has, all day long. It also provides a young stylish interactive experience at the Teppanyaki Grill, where the meal is accompanied with flavored organic sea salts and a choice of olive oils. The Reef Bar in the Maldives is designed to soothe the senses. Soak in the relaxed groove while sitting at the open-air bar overlooking the infinity pool. Cool down. Chill out. Take in the vibrant, modern scene. Reef Bar is a lounge in the Maldives where guests gather for an evening of fun. Arrive before sunset and bask in a mellow afterglow as the sun teases its way down. Sip on a sun-downer or sample any of the potent Reef Bar creations in this lounge in the Maldives. And, don’t miss the Prince creation – The Six-Salt Tequila Shot Tray. Truly indulgent, truly fun! Mama Mia – this is some great pizza! Fresh dough rolled into thin crusts and topped with ingredients of your choice, then baked in a live wood-fire oven – it doesn’t get better than this! So, grab a slice or two. Appreciate the flexibility of enjoying hand-rolled pizza at Pool Side, Reef Bar or Open – The Grill, while sipping on a signature cocktail. With pies that are bursting with freshness and flavour, a meal here will be an unforgettable experience for you and your family. Let us spoil you with the best pizza in the Maldives! Dig in and be delighted! The less intrepid can take stock and relax in the property’s Jiva Spa, inspired by the Indian philosophy of wellness while appetites of all ages will be whetted by the variety of fresh and enticing culinary options created by our talented chef’s brigade. An exclusive Spa with massage rooms, steam room and a retail boutique. The all-natural treatments draw on the ancient health and beauty traditions of Asia, from cultures that celebrate beauty & refinement and honour nature’s precious gifts. The exotic aromas of spices and fragrant blooms, and the gentle sound of soothing music, will bathe your sense and lull you into a state of relaxed bliss. Tucked in the heart of the island, the Jiva Spa features two double treatment rooms and two single treatment rooms with private soak bath areas. Guests can choose from authentic Indian, royal and holistic experiences which are especially designed to maintain physical, mental and spiritual equilibrium in life. The Jiva signature treatments offer a combination of balance, detoxification, deep muscular relief and relaxation. Guests can also choose Indian therapies and scrubs including the Pehlwan Maalish, Indian oil massage, Champi – Indian head massage and beauty treatments.